Millennials appear to be fluid in their use of print and digital for reading—but if the costs were the same, most would tend to prefer print. Those are two of many insights about Millennials’ views on print and digital reading platforms that were shared by Naomi S. Baron, professor of linguistics and executive director of the Center for Teaching, Research and Learning at American University, during the Magazines at Retail conference. Although Baron’s research focused on books, she said that she believes there’s considerable overlap with attitudes relating to reading magazines. The researcher surveyed 429 students ages 18 to 26 (mean age 20.9) in the U.S., Japan, Germany, Slovakia and India about reading for school and reading for pleasure. Asked whether they would rather read in hardcopy or on a digital screen, the results were mixed for both schoolwork and pleasure reading when the text to be read was short. However, if the text is long, 86% of the students said they’d prefer hardcopy for schoolwork, and 78% would prefer hardcopy for pleasure. Fully 85% of U.S. respondents, and 67% of all respondents, indicated that they multitask while reading on screens, versus just 26% of U.S. respondents and 41% of all respondents indicating that they multitask while reading in print. Baron did note that keeping a mobile phone at hand likely increases multitasking while reading in print. Asked which platform makes it easier to concentrate on reading (not get distracted or multitask), 92% of overall respondents chose hardcopy. Very few chose desktops/laptops (4%), tablets (2%), e-readers (1%) or mobile phones (1%). Asked what they liked least about screens, 20% (43% of U.S. respondents) cited the distraction/lack of concentration factor. However, screens are viewed as more convenient than print. A quarter of “like most” responses about screens praised their convenience. Also, another 41% of “like most” responses about screens were about ease of access to material, functionality of the device, being able to find words or information, or using the Internet. In contrast, 43% of all “like least” responses about reading in hardcopy complained about lack of convenience. Baron noted that bundling media—print plus digital access to content, for example—can provide more convenience options. Cost is “the 800-pound gorilla” in the print- versus digital battle, at least for students, said Baron. 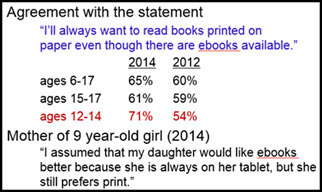 But in a finding that she said was the one that has most surprised her, 87% of the students reported that, if the costs were the same, they would prefer print over digital for academics—and 81% said the same about preferring print over digital for pleasure reading. Print textbooks was also the favored “method of learning” in a recent National Association of College Stores survey of college students (chosen by 40%). In addition, 26% preferred print text with a digital component. Just 7% preferred digital text, and 3% digital text with added digital components. Baron also suggested that one reason that independent bookstores, which are of course print-dominant, are seeing growth is that consumers, including younger readers, may be willing to pay more for having access to personal recommendations and assistance during book buying. *Digital content and small screens are resulting in an increasing preference for shorter text. As a result, Baron expects to see continued growth in short formats such as serials, “flash fiction” (1,000 words or fewer), Twitter stories, SparkNotes, “30-Second Series,” “SnackReads” and “longreads” (with number of words, reading time indicated). She also expects to see growth in bundled formats. *Many people don’t finish the e-books they purchase, according to usage tracking done by e-book distributors/sellers. The lower the price, the less guilt they feel about not finishing. Baron suggests that the same might be true for print books.